For over two decades, the Student National Dental Association (SNDA) has been fulfilling its purpose of promoting good fellowship and cooperation among its members and aiding in the advancement of minority students in dentistry. 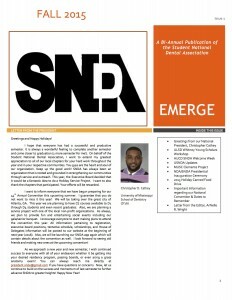 It has furthered these purposes through publication of a newsletter, organization of the Annual Conventions, liaison with other national dental groups such as the American Student Dental Association, and by assisting selected minority dental students financially, and all minority dental students interested in becoming actively involved with other dental students. For more information on the SNDA, you may visit their website at http://www.sndanet.org. In 1932, the National Dental Hygienists‘ Association (NDHA) was founded by African American Dental Hygienists’ to address the special problems faced by the minority hygienist in the profession as well as unite the limited number of minority dental hygiene practitioners in the United States. It functioned for three years under founder Ernestine P. Gates of Missouri. In the spring of 1962, Dr. James B Singleton, Dr. Eugenie Mobley and Barbara Ashby Robinson of Meharry Medical College contacted all of the African American Dental Hygienists’ known to them and invited them to meet in Detroit, Michigan for the purpose of reactivating the organization. During the 1962 National Dental Association (NDA) convention, the NDHA reactivated and implemented a restructuring initiative designed to enhance the visibility of the association. In 1963 NDHA elected it first President; Barbara Ashley. The NDHA joined the NDA in holding concurrent annual conventions. While the NDHA and the NDA still hold their functions jointly, the NDHA functions as a autonomous organization. Today the NDHA is a 501(c)3 non-profit organization designed to improve the dental health of the public through education and service. The NDHA board is comprised of five officers and five trustees who are elected by the ever growing general membership body. NDHA is proud to have 6 component Organizations functioning as official affiliated professional organizations: Wolverine Dental Hygienists’ Society (Detroit, MI) founded in 1972, TriState Dental Hygienists’ Society (Philadelphia, PA) founded in 1995, African American Dental Hygienists’ Association (Chicago, IL) founded 19__, City of Lights Dental Society (LasVegas, NV) founded 19__ , Angel City Dental Hygiene Society (Los Angeles, CA) founded 19__, RiverCity Dental Hygienists’ Society (Jacksonville, FL) founded 2009 and Music City Dental HygienistAssociation (Nashville, TN) founded 2011. The NDHA is a non-profit 501(c)3 tax exempt organization. It is an organization for licensed minority dental hygienists who have graduated from accredited dental hygiene programs and minority dental hygiene students who are enrolled in accredited programs. The NDHA is committed to cultivating and promoting the art and science of dental hygiene. The members of NDHA are especially active in the efforts to enhance access to oral healthcare for the under-served communities. The NDHA aims to provide a professional foundation for students by serving as mentors as they transition from students to licensed dental hygienists. Promote the highest educational and ethical standards for dental hygienists. Create definite position statements on issues impacting the profession of dental hygiene. Enhance recruitment efforts for minority students’ communities in need. Assist in the access to oral care for the under-served communities in the United States. Improve the Associations’ visibility via public service. Provide a professional foundation for Minority Dental Hygienists. Increase the number of Minority Dental Hygienists. Seek and encourage under-represented minorities to enter the profession of dental hygiene and give support to their endeavors. Cultivate and promote the art and science of dental hygiene. Provide an arena for the development and advancement of the dental hygiene profession. Maintain the highest professional standards and education of dental hygienists. Promote membership of under-represented minority dental hygienists into organized dental hygiene and encourage membership retention. Increase public awareness of the profession of dental hygiene. Enlighten and direct public opinions related to dental hygienist and the dental hygiene profession. Promote mutual improvement, social interaction and goodwill among its members. Disseminate dental health education information. Provide current, research based, dental hygiene academic and clinical information to its members. The NDAA is an auxiliary of the National Dental Association. We are composed of Office Managers, Dental Assistants, Receptionist, Treatment Coordinators, Clinical Coordinators, Finance Specialist, and any office personnel except the Dentist and Hygienist. The objective of our Association is to promote the education of the dental assistants and staff to improve and sustain the profession of dental assisting, and to contribute to the advancement of the dental profession and the improvement of public health. NDAA provides an opportunity for intellectual growth and development. We improve the status of dental assistants in the public eye. We encourage and assist dental assistants and staff to form local groups, organize, and develop plans for educational needs in their communities. We offer certified continuing education programs for those who need Certification Renewal through Scientific Sessions, and we also provide scholarships for qualified students and who studies dental assisting and dental administration. Why you should become involved with NDAA as a Dental Assistant, Office Manager, Receptionist, Finance Specialist, Treatment Coordinator, and Clinical Coordinator? The Auxiliary to the National Dental Association (ANDA) is comprised of spouses of dental professionals. Our organization serves as a supportive group to family members and friends of the National Dental Association (NDA), ANDA, and affiliated NDA organizations. ANDA embraces the NDA’s mission of service to the community, dental student education and scholarships. As ANDA members, we meet throughout the year via teleconferences to execute our business for national-level meetings at the Annual NDA Convention. Our Membership and Executive Board Meetings are held annually at the NDA conventions. It is a pleasure to be elected as ANDA’s President for a second two- year term, 2015 – 2017. Our leadership and convention planning teams are busy at work planning for the upcoming next National Dental Association Convention, Atlanta, GA.
Communication/Educational Outreach,g. marketing to attract new members with emphasis on spouses married to female dentists, and dental care/educational awareness. Partnerships/Relationships, e.g. leveraging partners’ resources, and access to community service activities, and financially supporting dental students via scholarships. ANDA Branding,g. Improving visibility and showcasing its value proposition in support of NDA families and continued support of community service outreach projects. Our collective and collaborative efforts will go a long way in advancing the mission of NDA by engaging our affiliate organizations and their members as well as promoting noteworthy community service projects. Let’s collectively cultivate our partnerships in ways that have lasting “positive” impacts on our families, especially our children’s future career endeavors during their academic matriculation. On behalf of ANDA, I invite you to visit our new and improved website at www.ANDAnow.com for more information—i.e. how you can get engaged with us and relevant information for the upcoming convention planning.